Bread has been the center of my meals for a large part of my life. As a kid I can’t remember a meal that didn’t include a plate filled with slices of homemade bread. My mom baked homemade bread every other week when I was a kid. I still can remember the aroma of homemade bread when walking in the door from school. My mom would slice thick slabs of fresh baked bread and top them off with sweet butter for my siblings and me. These days bread is not served with every meal and quite honestly I don’t usually have homemade bread to serve. But there are occasions when some kind of homemade bread is called for. Such as homemade soup or chili, bread is a perfect addition. 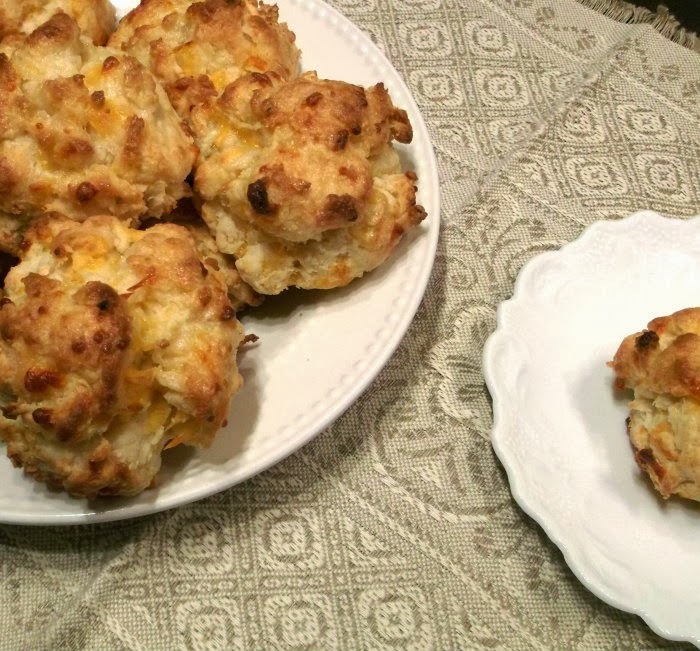 That is exactly what I did when we had chicken chili; I made these cheddar onion drop biscuits. Biscuits may not be the yeast breads that my mom made when I was a kid, but I have to say these were pretty darn yummy. They are simple to make and they are on the table in no time. 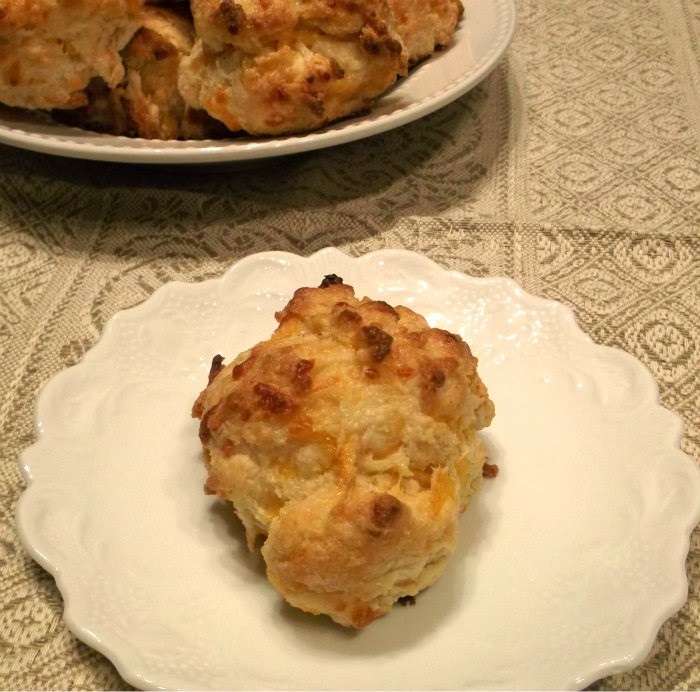 Cheese and onion made these some of the best biscuits I have ever eaten; then when they came out of the oven they were brushed with melted butter and garlic powder for more flavor. Needless to say they went great with the chili. 1. Preheat the oven to 450 degree F. Lightly grease baking sheet. 2. Whisk the flour, baking powder, baking soda, and salt together in a bowl. Cut the butter into the flour mixture until the mixture resembles coarse crumbs. Stir the onion, Parmesan cheese, and Cheddar cheese into the flour mixture. Pour the buttermilk into the bowl; stir until evenly combined. Drop by 1/4-cupfuls onto prepared baking sheets, about 2 inches apart. 3. 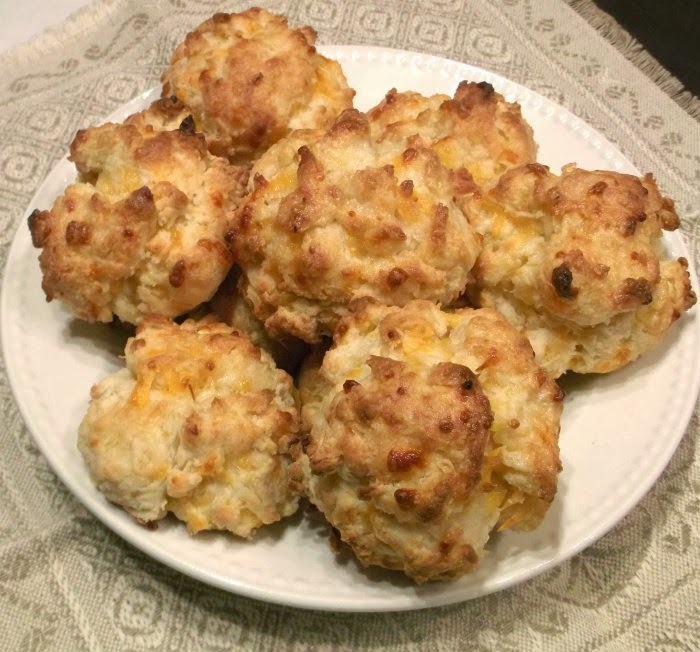 Bake in the preheated oven until the tops of the biscuits are lightly browned, about 12 to 15 minutes. 4. While the biscuits baking melt the 2 tablespoons of butter and mix in the garlic powder. When the biscuits come out of the oven brush them with the melted butter mixture and serve warm. I usually only have bread with soup or sandwiches and thankfully it’s the season for both of those!! Love these biscuits as a soup accompaniment! I usually make cornbread with chili but I’m definitely going to try these next time. It’s great to have another option that goes well. You totally sold me on the “drop”, much easier to handle…look delicious Dawn. I love the combination of onion and cheese.